← MARK BEESON. ANZUS: Too obliging for our own good? Every year the Australian Competition and Consumer Commission reports on competition and consumer issues in private health insurance (PHI), and recent reports show increasing consumer dissatisfaction with PHI. Most complaints relate to unexpected charges when claims are made and confusion over terms and conditions. 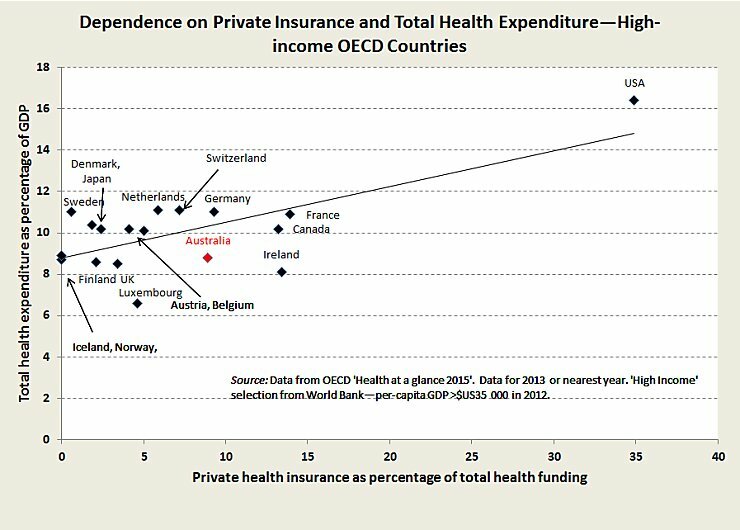 The relationship between use of PHI to fund health care and the total cost of health care is shown in the graph below. This article originally appeared in Health Voices, the Journal of the Consumers’ Health Forum. See also the following links concerning private health insurance and alternatives. John Menadue. Health Reform and cooperative federalism. Part 1. John Menadue. Health Reform and cooperative federalism. Part 2. This entry was posted in Health, Politics and tagged $11 billion PHI subsidy, health, Ian McAuley, Pivate health insurance, politics, Treat to Medicare, Whitlam and Medicare. Bookmark the permalink. Privatisations in vital services should never have been permitted! Under neoliberal philosophy we have entered this mess over 4 decades! Why do banks, corporations and wealthy investors want to privatise major social infrastructures that people need, because privatising it is like conquering a new country and being able to take its income. instead of governments providing them to the economy, to make the economy operate at a lower cost, you can make people pay two or three times as much as they were doing. Operating this infrastructure for profit (with high-interest credit) will vastly increase the cost of the economy, without increasing wages or the ability to pay for these privatised services. This will squeeze the living standards while sucking up more and more money to the top of the economic pyramid. A very interesting analysis. The one thing you don’t mention is using tax policy to direct “high income earners” into PHI under pain of financial penalty otherwise. This is not a free market but government using the power of the state to interfere with individuals’ choices in order to enrich for-profit corporations. In other words if left to market forces under a truly liberal government that removed both subsidies and tax penalties, the PHI sector would collapse. For all the reasons of opaque, complex and confusing regulations mentioned in the article, I would rather have the money I pay as insurance premium go into public coffers instead as tax, and rely on a better public health delivery system. Where is your evidence high income earners are exempt from Medicare levy? Please detail. My understanding is all pay depending on tax returns. Do you mean high income earners who have a low taxation required to be paid because of deductions? The previous PM Abbott proudly said that private health insurance is in the DNA of his party, a clear and unambiguous admission of an ideology-based position. One would hope that Turnbull might make decisions on this matter based on evidence, not ideology – or, for that matter, on the basis of political donations. The very interesting thing about this continuing discussion of the effectiveness of the large and escalating government support of private health insurance is the almost complete lack of response or rebuttal by the private health insurance industry. Why?